This trip is all about finding Polar Bears, however there may be a small amount of geology to be seen as well but this depends how much time is spent in the sea ice and how much time is spent on land. Day 1 - Arrive in Longyearbyen, the administrative capital of the Spitsbergen archipelago of which West Spitsbergen is the largest island. Before embarking there is an opportunity to stroll around this former mining town, whose parish church and Polar Museum are well worth visiting, while in the surrounding area of Longyearbyen. In the early evening the ship will sail out of Isfjorden. Day 2 - We visit Raudfjord or Liefdefjord on the north coast of West Spitsbergen, beautiful fjords dominated by spectacular glaciers and favoured by Ringed and Bearded Seal and where we often sea Polar Bear. In the evening we will sail by the island of Moffen where a big herd of Walrus can be found. Day 3 – 4 - We sail through Beverleysundet named by Parry in 1827 and also sailed by the Swedish-Russian Arc-of-Meridian Expedition in 1898. We push east to reach the area of Nordaustlandet, where the Nobile expedition drifted around in 1928 and where the Italian Sora tried to come to the rescue. There we hope to get to Alpinøya, reached by Sora in 1928, and then to the mouth of Finn Malmgrenfjord, and Albertinibukta and to climb Soraberget (205 M) from where we have a fantastic view on the icecap of Nordaustlandet. Alternatively we will land at Storøya, where again we may meet a group of Walrus. Day 6 - Retracing our route westwards, our route takes us through and along the pack ice, keeping watch for Polar Bear and the elusive Greenland Whale (Bowhead). About 40 nautical miles west of Spitsbergen we sail along the edge of the continental shelf, where Fin Whale forage in summer in the upwellings along the Spitsbergen banks. At the mouth of the Kongsfjord we have also good chances to see Minke Whale. Day 7 - We land at the northern tip of Prins Karls Forland near Fuglehuken. Seabirds nest on the cliffs, and along the coast we see Harbour Seal, the only population found in Spitsbergen. Here we also will observe the remains of the Polar Bear hunting era, with demolished set guns and bear traps. At the opposite site of Forlandsundet at Sarstangen is a haul out place for Walrus. Alternatively we sail into St. Johns Fjord or south to the mouth of Isfjorden and land at Alkhornet. Seabirds nest on its cliffs and Arctic Fox search the cliff base for fallen eggs and chicks, while Spitsbergen Reindeer graze the relatively luxuriant vegetation. At nighttime we arrive in Longyearbyen. 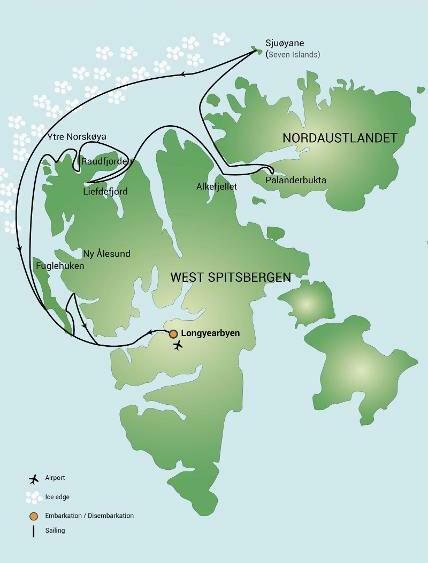 Day 8 - Return to Longyearbyen and disembark for the transfer to the airport and the flight to Oslo and home.